An Oscar was always on the cards for Dame Helen Mirren's portrayal of the monarch in the film, The Queen. 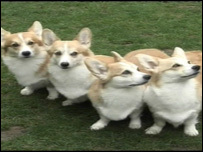 But some of its more unlikely stars have now also been recognised for their contribution - the five corgis used to represent the Queen's favourite pets. Poppy, Anna, Alice, Oliver and Megan were named Best Historical Hounds and Best in World at the first Fido Film Awards in London on Sunday. The dogs were trained by Liz Smith of Little Blakenham, Suffolk. The corgis featured-prominently in the film, which dealt with the immediate aftermath of the death of Princess Diana. Dame Helen said: "I know one should avoid acting with animals and children, but these little chaps were a pleasure to work with and deserve all the plaudits for their fine performances." The corgis' big chance came when Mrs Smith was spotted obedience training two years ago. "Every time I watch it (The Queen) I have a few tears in my eyes because I am so proud of them", Mrs Smith said. The Fido awards are part of the British Film Institute's London Film Festival, which has decided to emulate the Palm Dog Awards which have been a popular fixture at Cannes for seven years.